Our Raw Organic Shea Butter and Organic Extra-Virgin Coconut Oil are food for your skin! That's what makes Riverstone Naturals Lotion Bar so effective in moisturizing dry, scaling and cracked skin. No alcohol, no water, no chemicals or perfumes. Perfect for extra dry, normal and sensitive skin. 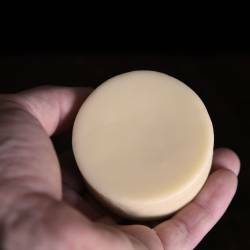 Our easy to pack Lotion Bar is ideal for traveling and life-on-the-go. Pop the Lotion Bar out of the tin, warm it in your hands for just a moment and rub the bar directly onto your skin. Rub it around until evenly distributed. Re-apply as needed. Return the Lotion Bar to the tin and secure the lid.